Thunder Boy Smith Jr. loves his dad, Thunder Boy Smith Sr., aka Big Thunder. But he doesn’t like sharing a name with his dad, and he really doesn’t like the nickname that comes with it, Little Thunder. “That nickname makes me sound like a burp or fart,” he complains. So Thunder Boy Jr. starts brainstorming ideas for his new name, and tries to figure out how to talk to his dad about his feelings. Sherman Alexie’s new picture book Thunder Boy Jr. is an examination of the concepts of identity and family, as a child tries to figure out his own place within his family and culture, and also who he is separate from those things. Though he enjoys a happy and loving relationship with his parents, he is starting to think about who he is apart from them. The inspiration was drawn from Alexie’s own life, since he is himself a Junior (indeed that was also the name of the character in his semi-autobiographical YA novel, The Absolutely True Diary of a Part-Time Indian). Surprisingly, the seed of the idea for the book came to him at his father’s funeral, when he was struck by the reality of seeing his own name on his father’s tombstone. Thunder Boy Jr. is illustrated by Yuyi Morales, who received a Caldecott Honor for Viva Frida in 2015, and is also a multiple winner of the Pura Belpré Award. The background colour palette is relatively muted, with occasional splashes of colour, but the bright colours show up more prominently in the clothing of the characters, and also in Thunder Boy’s imaginative sequences. Both background and foreground are beautifully textured, adding depth to the colours. Morales scanned many of the colours and textures from “the remains of an antique house in Xalapa, Mexico,” and incorporated them into her digital paintings to achieve this effect. Over at American Indians in Children’s Literature, Debbie Reese has written a number of thoughtful and interesting pieces about Thunder Boy Jr. She addresses a few potential issues, including the fact that no tribe is specified to contextualize the naming traditions depicted (potentially leading to the idea that all Native American tribes are the same), and also raises concerns about how the story might further the appropriation of those traditions. She called for an author’s note to address some of these problems, since the 100, 000 copy print run of the book makes it evident that the audience will reach well beyond insiders who already have the context to understand this without explanation. After the sequence in which Thunder Boy Jr. imagines a variety of possible names he might take for himself that celebrate his own actions and identity, he says “I love my dad but I want my own name. What do I do? What do I say?” For me this seemed like the natural place to address some of these issues with a conversation between Thunder Boy and his father about his feelings. So when I turned the page, I was a bit disappointed to find that rather than addressing the importance of communication, Thunder Boy Sr. just knows how his son is feeling, and decides it is time to give him a new name. “My dad read my mind! My dad read my heart!” Thunder Boy Jr. enthuses. And while this was a touching moment, it felt like an easy out. Despite these issues, Thunder Boy Jr. is a humourous and touching children’s book dealing with significant themes. Thunder Boy has an honest, child-like voice, and I think kids will delight in the potty humour of his perception of his nickname. Hopefully we can all read responsibly and not take this as an invitation to demean or appropriate Native American naming traditions. These are my favourite fiction books read or reviewed (not necessarily published) in 2015. Click the titles for links to the full reviews. Check back on Thursday for my top non-fiction picks. It only took me eight years to get around to reading Sherman Alexie’s popular young adult novel about a Native American boy who decides to leave the Spokane reservation to attend school in a nearby town that is predominantly white. Junior hopes that the education he receives there will help him achieve his dream of becoming an artist, but he struggles to be accepted by his classmates, and also faces rejection by members of his tribe who believe he has betrayed them. Alexie uses dark humour to cope with the tragedy Junior faces in his life, and Ellen Forney’s accompanying illustrations are just as poignant as the prose, but more concise. I actually read this book twice this year, once at the insistence of a friend (thanks, Amelia!) and then again with my book club. By contrast, it only took me two years to get around to Chimamanda Ngozi Adichie’s critically acclaimed novel about a young Nigerian couple, Ifemelu and Obinze, who are separated when Ifemelu goes to the United States for college, and Obinze is unable to get a visa to join her. With America’s borders closed to him, Obinze finds himself in living London on an expired tourist visa, and working as an undocumented immigrant under other peoples’ names. Fifteen years later, Ifemelu decides to return home to Nigeria, though she is unsure if she wants to see Obinze, who is now married. Americanah is a big, sweeping novel that combines cultural criticism with the story of star-crossed lovers. During her time in America, Ifemelu explores the differences between the experiences of a Black African woman, and those of African Americans, and is forced to confront American beauty standards, particularly as they concern hair. When she finally returns home, she must face the fact that she has been changed by America, and that Nigeria has changed in her absence. When it comes to books I read this year that were just pure fun, Carry On is at the top of the list. Spinning off from her 2013 novel, Fangirl, Rainbow Rowell brings to life the world of Simon Snow, formerly only a story-within-a-story in Fangirl. Simon is the Chosen One, supposedly destined to defeat the Insidious Humdrum, but as he enters his final year at Watford School of Magicks, he is more concerned about the fact that his roommate–the devious vampire Baz–hasn’t turned up for classes, and is probably out there somewhere plotting to kill him. Carry On features a playful magical system built on the power language gains through puns, word play, literary references, and other usages tap into our common imagination. Rowell also riffs on familiar themes and tropes from Chosen One stories, and generally has a rollicking good time. This heartbreaking novel of family tragedy by Celeste Ng topped a lot of last year’s best fiction lists, and for good reason as I finally discovered. When sixteen-year-old Lydia’s body is found in the lake of a small Ohio college town in the spring of 1977, the rug is pulled out from under the Lee family. James and Marilyn’s mixed race marriage is a delicate balancing act, and their children Nath and Hannah struggle with being among the only non-white residents of their small town. Each member of the family takes a turn narrating, and each understands something about Lydia that the others have missed, but alone none of them can quite understand how she could have died. As Celeste Ng peels back the layers one at a time, her novel becomes an autopsy of a family in the aftermath of the death of one of its members. Although I’ve singled out Manners and Mutiny here, honestly this is a tip of the hat to Gail Carriger’s entire “Finishing School” series, of which Manners and Mutiny is the fourth and final volume. I devoured the first three volumes as audiobooks, delightfully narrated by Moira Quirk, whose accents and voices bring Carriger’s witty banner to life. However, I read Manners and Mutiny in dead-tree form, and can confirm that the books themselves are just as much fun. Sophronia Temminnick’s mother deplores her daughter’s adventuresome behaviour, and decides to send her off to finishing school to become more ladylike. Unbeknownst to Mrs. Temminnick, Mademoiselle Geraldine’s is no ordinary finishing school; in addition to learning etiquette and charm, Sophronia also receives a first class education in espionage aboard a wandering dirigible. At the school, Sophronia makes friends and enemies, and becomes versed in the supernatural politics of a Victorian England populated by werewolves and vampires as well as mechanical servants. In Manners and Mutiny, Sophronia is called on to foil a Pickleman plot to take over the nation’s mechanicals. She must also make a choice between Soap and Felix, two very different boys who have been vying for her affections. That’s it for me! What were your favourite fiction reads this year? Happy April Fool’s Day! This post is not a joke. Rather, it is time to report in on how I’ve been doing with the reading goals I set myself all the way back in January. I set my reading meter to 116 books, and have gotten mildly ahead of schedule. I have read 40 books so far, putting me at 35% finished when I only need to be at 25%. The original idea was to slow down a bit and focus on my second goal, but I already had a bunch of books on hold at the library, so I plowed ahead and kept reading them as they came in. I did have to continue to keep my eye on what I was reading though, in order to stay on top of my second goal. Reading 116 books in a year isn’t much of a challenge for me, but last year only 10% of the books I read were by authors who aren’t white. This isn’t surprising given the state of the publishing industry, but it was something I wanted to do better at. Knowing myself, I need to have a measurable goal in order to change, so I set the challenge that 25% of the books I read in 2015 would be by authors who are members of a visible minority. Of the 26 books I have reviewed so far this year, 12 of them have been by diverse authors, putting my reviewed books at an amazing 46%. However, I’ve also read quite a few books that I haven’t reviewed. Of the 40 total books I’ve read this year, 14 of them were by diverse authors, so my actual total is more like 35%, still well ahead of my goal of 25%. You can find the qualifying reviews by checking out the posts in my Challenges category. I’ve discovered that plenty of books by diverse authors are crossing my radar on a regular basis; it is just a matter of flagging those books and giving them a higher priority on my TBR pile. Even without pushing myself to read genres or topics that are outside my usual areas of interest, I have had no trouble finding plenty of diverse books for this challenge. I’ve got a stack of a dozen more qualifying books standing by, and still more on hold at the library. 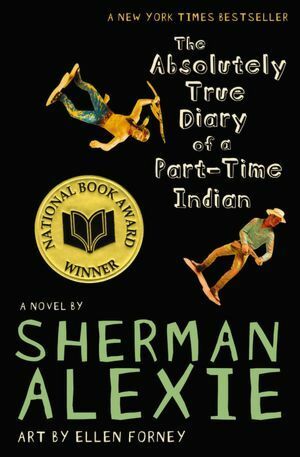 I finally read the truly excellent Absolutely True Diary of a Part-Time Indian by Sherman Alexie. I became utterly immersed in Aaliya’s strange literary rituals in An Unneccesary Woman by Rabih Alameddine, and next week I am leading a book group discussion of The Book of Unknown Americans by Cristina Henriquez. I didn’t love every book I read (looking at you Songs of Willow Frost) but so far, the challenge has been an overwhelmingly positive experience. How are your 2015 reading challenges going? Do you have any diverse books you would like to recommend? Fourteen-year-old Junior has spent his entire life on the Spokane Indian reservation, the subject of frequent bullying due to the lisp and stutter created by being born with hydrocephalus. When he unexpectedly loses his cool and hits his teacher with a textbook, he is suspended from the reservation school. Rather than returning at the end of his suspension, he seizes the opportunity to enroll at Reardan High School, in a nearby all-white farming town. Reardan is only twenty-two miles from Wellpinit, but it feels like another planet, where Junior must adjust to the culture shock in order to achieve his dream of becoming an artist. Sherman Alexie’s popular young adult novel is a darkly funny story of the sort where you have to laugh so that you don’t cry. The emotional swings can be sharp, going from an awkwardly humourous anecdote to a character death in a matter of pages. At fourteen, Junior has attended forty-two funerals in his life, many of them related to the alcohol abuse that is rampant in his community. Originally published in 2007, the book has made ALA’s list of Top 10 Challenged Books every year since 2010, being challenged for everything from offensive language to drug use to sexual content to racism. Alexie’s raw honesty about race issues and teen behaviour has consistently proven to be too much for censors to bear. Even after Junior combats some of the more overt racism at his new school, he still has to cope with the isolation that comes from being rejected by both his classmates and the members of his tribe who feel that he has betrayed them by going to the white school. As much as the rejection of his tribe hurts, Junior also has to come to terms with that fact that he isn’t really the underdog. When he joins the Reardan basketball team and faces off against his former classmates from Wellpinit, the prospect of victory is soured by the knowledge that many of the kids playing on the reservation’s team probably didn’t eat breakfast that morning. Alexie doesn’t pull punches or state things in delicate terms, but his story is full of keen insight and reflection nevertheless. His observations are counterpointed by Ellen Forney’s incisive illustrations, which sometimes cut to the heart of the matter better than words themselves. If this book has a drawback, it is that so much happens to Junior in the period of one short school year. Sherman Alexie is trying to cover a huge number of issues in book that is well under three hundred pages long. Inevitably, some of the events do not get much attention, and plot threads are only partially resolved. Then again, life doesn’t play fair and spread tragedy out evenly, either. 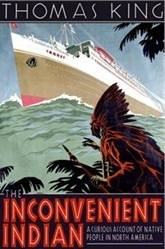 You might also like The Inconvenient Indian by Thomas King.